The OBA has the 2012 metrics for download here, and you’ll probably have to log in to get it. Even though it is the 2012 report, it’s really analyzing 2011 stats. If you were to guess the most likely day an optometrist takes off, you would guess Sunday, of course. But did you know the second? Turns out that about a quarter of us take Mondays off. That’s me, too. I like to pretend I have a weekend. …only a minority of affiliated practices actively market medical eye care services today. Okay, #1. Part of the reason that I don’t spend on advertising is that I don’t collect a lot of money to do so AND I’m in a high traffic location anyway, so spending a lot on external marketing doesn’t make a lot of sense. Maybe Sam’s Club doctors should spend more, but one of the advantages of being a Walmart doctor is that my marketing budget can be low since I have more awareness by default. Also, private practice doctors spend more on marketing because they sell $500 pairs of glasses. I only collect money on exams. My gross is much less, so my overhead should be less and that includes the marketing dollars. #2 and #3 are related. Again it goes back to overhead. If I wanted the headaches of hiring, paying, training, providing benefits, scheduling, managing complaints, and firing staff…then I would be a private practice doctor. If I let Walmart handle the headaches, then why can’t I also let Walmart handle the service improvement process while I make the occasional suggestion? Also, where am I supposed to get all this money to compensate the staff I hire? If I’m a one-room doctor whose appointment book is not full, then what incentive do I have to spend money on staff? If I’m a doctor whose appointment book is starting to get full, it’s a big cut in pay for me to hire more staff, hope business picks up, and somehow try to change exam-traffic flow in a Walmart optical floor plan. Speaking of which, where does my hired air-puffer do my insurance billing when they’re not taking acuities? There is no nurse’s station. The Walmart floor plan needs to change before I get crazy and hire a staff of people. First, there are three major insurance carriers in my area who only allow ophthalmologists on their panels- no optometrists. Second, if I start seeing a whole bunch of medical insurance people, then my accounts receivable will go up, and these are sicker patients who take up more time in the chair. Then I’ll have to start raising exam fees. Once I start raising exam fees, business will taper off because that’s the whole reason most people come to Walmart: the exam is cheaper. Some people think it’s fine to charge a wildly different exam fee for “medical” vs “routine vision,” but I’ve addressed this topic elsewhere. In summary, I don’t think having a $50 “routine” eye exam while charging $150 for a “medical” eye exam is ethical. On the other hand, I would love to charge some patients more if their case is complicated, but try explaining that to someone who got quoted a certain price, so that’s why they signed up for an exam. They won’t be happy paying more than they expected. I wouldn’t mind having an hourly rate. I think that would be more fair for everyone except the insurance companies. While the medical model has varying levels of exam, like Level II-New vs. Level IV-Est, which depend upon the history, exam, and complexity of that particular case; however, there are some among our profession that make it an especially hard question to answer, and this issue raises concern over the ethics of a fairly popular fee structure. But are they really? Sure, for a “routine eye exam” where nothing is wrong and you just want your glasses updated, then it’s the $45. But what if I have some allergy eyes, so the doctor gives me a prescription for Pataday as well as my glasses Rx? All the sudden the exam somehow costs $120!?!? Huh, something funny going on around here. I think big box doctors are more likely to do this since their exam fees are so low, they make up for it by gouging in other fees. I have no problem with a doctor who says their S0620 is $100 and their 92004 is $120. However, I think there is something wrong if the S0620 is $45 and the 92004 is $140. It’s like some among us in the optometric profession are playing the windshield chip repairman scheme. But what really happens? Patients won’t typically notice this bait-and-switch. It’s really the insurance companies who get hammered. The patient pays their copay, and if the doctor can come up with any excuse to bill a medical code, they use their medical model fee structure to justify it. Ethics applies when we realize that, for some reason, private pay patients are rarely charged the same high fees as the insurance companies. Huh. Oh well. It’s a victimless crime because those big, bad insurance companies won’t miss the extra cash. Until we realize that the more insurance companies pay out, the more the patient’s premiums will be raised next year. Whoops. Sorry, Mrs. Smith, that you can’t afford to keep your medical insurance in the future because I wanted to get paid double or triple my usual fee because you have insurance today. By the way, it cost me about $2000 to bill insurance last year (PIM software license, E-filing charges, and postage/paper for mailing statements/refunds). Also add to that the cost of time spent filing claims and handling overpayment and underpayment. If I didn’t have to deal with insurance, I could drop my exam fee by at least $5 per person. I have an idea: All patients should pay for office visits out of pocket. If they have insurance, get reimbursed later. The doctor won’t know about their insurance, so there won’t be a conflict of interest about what exam fee structure he’ll choose. The doctor can lower his fees since filing claims is expensive and time consuming. Everyone wins. Another idea, insurances should allow me to charge either them or the patient a $5 claim filing service fee. Take home point: I don’t believe it is ethical to have one fee structure for insurance patients and another drastically different one for private pay. Yes, I’m all for charging more money if something is more work and more time. 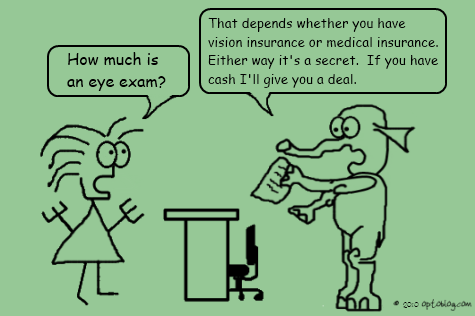 That’s why a contact lens evaluation is paid on top of the routine eye exam. That’s why there are different levels of 99*** office visits. But sneaking a huge fee onto an insurance claim just because there is some medical code excuse is something I don’t think our profession should feel comfortable with. This post is way out of date. 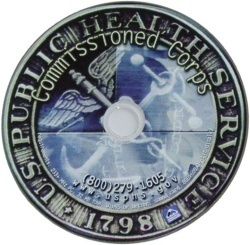 In the wisdom of the government, the USPHS is apparently trying to be more military-like. One of the sequelae of this movement is that hardly anyone makes it to O-6 anymore- especially not some optometrist who often works alone, supervising one tech/receptionist. Even the Pharmacy Dept Supervisor, who supervises 3-4 other pharmacists plus 4-6 techs, is typically only given an O-5 billet! RIDICULOUS if you ask me. So any calculations below from 2008 showing what great pay and retirement you’re going to get, heavily based on the idea that anyone who puts in the time will get an O-6 by the end of their career, are just plain wrong now. Those glory days are gone- sailed away with the salt-and-pepper uniform. I was going to delete the entire post, but I’ll leave it for posterity’s sake. 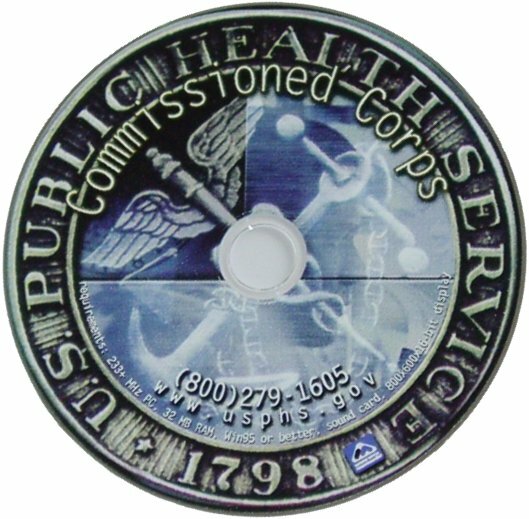 I worked for the USPHS, detailed to the IHS, for 2 years. I would have stayed longer, but I wanted to live in Utah or Idaho. The positions available in these two states were filled with young optometrists that appeared to me like they weren’t going to move away anytime soon, so I made my move to go into private practice and then later into Wal-Mart practice. Looking back on my decision to leave, it would have been much better for my financial situation to stay. In fact, I am going to argue that for any optometrist, the financial rewards for practicing optometry are equal to and most likely better in the Commissioned Corps than in the private sector. Government optometry work seems to get little attention in optometry school. Most everyone has delusions of grandeur about how comfortable their living will be while working in private practice. Of course, that dream turns into a nightmare when they work for another optometrist paying them little more than a resident but with the hint or promise of a buy in which later fizzles out. Many people think of government optometry only when they want to go into the military just to get their school loans paid off and then get out. Many do not stay because promotion in the military is limited. Many years ago the USPHS used to have an automatic promotion schedule, but that has been replaced by merit promotions. A recent transformation of the commissioned corps of the USPHS has made it harder to get promoted just for showing up; however, your chances of getting promoted to O-6 (equivalent to a Colonel or a Navy Captain) are much better in the USPHS than other uniformed services. For an estimate of what monetary compensation you might get in the USPHS, I’ve made this table. It’s a little tough to understand unless you are used to military pay systems. They have what is called base pay which is calculated from your rank and years of service. But then other types of pay like Housing Allowance and Subsistence which are variable depending on where you live. You also get pay for being an optometrist: Optometrist Special Pay and Optometrist Retention Pay which helps equal your pay to private sector optometrists. You can get even more money by getting your FAAO and by hopefully getting loan repayment. Also you get up to $1000 reimbursement per year for travel and tuition expenses for continuing education. My PHS pay estimate is based on a theoretical advancement in rank. Promotion is not guaranteed nor is it on a set timetable. There has been cases where an officer was frozen at O-5 and wasn’t allowed to be promoted to O-6. I also assume that one stays 30 years in the corps. You can get out as soon as 20 years, but your retirement compensation is less. Now, I’m no accountant or financial planner, but I believe that my PHS pay estimate table shows that compensation inside PHS is probably better than what you can expect to achieve in the private sector as an optometrist. A private sector optometrist would have to invest ~$24,000 a year just to get the same retirement that a 30-year PHS optometrist gets. Anyway, this should dispel the myth that PHS optometry pay isn’t comparable to private or commercial optometrist pay. I’d say it’s better based on my calculations. Now, what can you expect if your join the USPHS? There are a small few who work in the FDA and Bureau of Prisons. You could also work your way up and do non-clinical duties at USPHS headquarters. But the majority of PHS optometrists work in the Indian Health Service. You can work in the IHS as a civil servant or direct tribal hire, but for a career IHS optometrist it is most advantageous to go the commissioned corps route. Same job as an optometrist but different pay system. Where can you work? 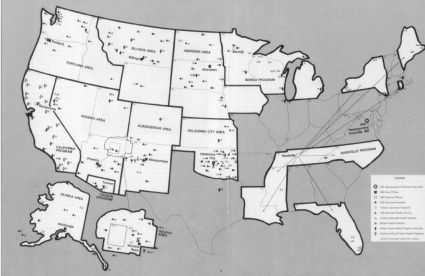 Well, here is a map. But a better way is to browse through the PHS-IHS directory regularly updated here. But not every place has an opening, so you need to look at the current Vacancy Announcement (a.k.a. Recruitment Announcement) regularly updated here at the IHS Optometry web page. You can find optometry job announcements in IHS by going to their website job page and then selecting “Optometrist” in the Professional Categories pick list. I find that this page isn’t updated as quickly as the IHS optometry page, though. In my next few posts, I’ll talk about non-monetary benefits of working for PHS-IHS, tips and tricks for applying with the PHS-IHS, more about rank advancement, and the Loan Repayment Program. Basic Allowance for Housing is the biggest variable, estimated in table it at ~1200.